The main advantage of a good Mandoline slicer is the consistency, all produce is cut into even slices and due to this you are ensured that all your produce will cook, dehydrate and bake evenly. Most Mandoline slicers are provided with different slicing blades for julienne strips, crinkle cut slices and waffle cuts. The versatility of these blades adds different textures and a professional look to meals. Preparation time is cut down with a Mandoline slicer, a Mandoline slicer on average cuts produce up to 50% more quickly than using a knife especially for items that are difficult to cut such as potatoes, carrots and beetroots etc. Owning a Mandoline slicer means you have more time outside the kitchen, doing things that matter to you such as spending time with loved ones. Mandoline slicers are affordable and the value on the appliance is much more than what you pay for it. Mandoline slicers have a simple design making them easy to use and clean. It is environmentally friendly, most Mandoline slicers are manually operated and do not use any electricity. Raw food friendly. With a Mandoline slicer you can create culinary raw friendly meals. Tomato Slices - Slicing tomatoes can be a tiresome chore especially if you need to slice a large quantity but with a Mandoline slicer you can slice a large number of tomatoes in next to no time at all. Whether they will be for sandwiches, a salad, dehydrating or as a pizza topping. You will get the perfect slices every single time. Onion rings - How many times do you need thin slices of onion? Hamburgers, deli sandwiches, onion soup, batter-dipped onion rings, onions for salad. Onions are so much easier to slice using a Mandoline slicer. Vegetable and Fruit slices - Salads are a must have at all times but they are quite enticing in the summer months due to their coolness. With a Mandoline slicer you can chop up all your produce quickly and with minimum effort. Carrot slices - Cutting carrots is a kitchen chore that most people run away from, myself included no matter how sharp the knife is, it is tough to slice through a carrot even tougher to get thin, even slices for salads and stews. A Mandoline slicer makes quick work of carrots whether you want to cut them into rounds, ovals, or long, thin slices. Shredding - Shredding is a must for some kitchen dishes such as coleslaw, sauerkraut and kimchi etc. 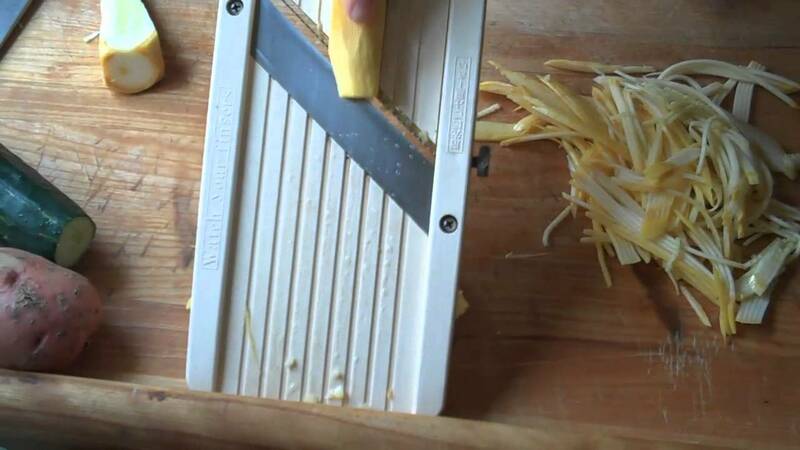 The Mandoline slicer does all your shredding for you with just a little assistance form you. Potato chips - I have always wondered how companies like Lays or even Simba got the perfect slices for their chips. The few times I attempted to make at home some of my chips tasted like mashed potatoes, others were crispy and perfect while others were just undercooked. The secret to chips is you need the thinnest slices and such slices are only achievable with a Mandoline slicer! Garnish - If you need perfect slices of lemon, cucumber, or lime to put in water (adding fruit and herbs such as mint into water not only adds flavour to your drinking water but it also good for detoxing purposes). You can also 'grate' perfect lemon, orange rinds for cake toppings and other garnishes. Raw Pasta - By attaching the correct blade and cutting the vegetable lengthwise you can create mouthwatering, nutritious raw and vegan friendly pasta. Cheese & Chocolate - A Mandoline slicer isn’t just for fruits and vegetables. You can use it to slice or grate any firm cheese and chocolate.